Constructor Search uses natural language processing (NLP) and artificial intelligence to present query results that approximate user intent. Inferring user intent enables accurate search results and increases purchase rates, making NLP an important contributor to successful searches. Inferring intent is simply not a feature of traditional search engines. Users prefer accurate results from search on the first try. So do site owners. And poor query results is a real business issue because nearly 12% of product searches have errors that could undermine the search journey. NLP keeps your users on task and satisfied. It assists and guides them toward their intended results. It figures into improving results both as users type their queries with AutoSuggest and in the broader set of prioritized results through full Search. And Constructor Search works fast, faster than users can type their queries! When users search for butter, they want to see salted butter or cream butter, not crunchy peanut butter in their results. 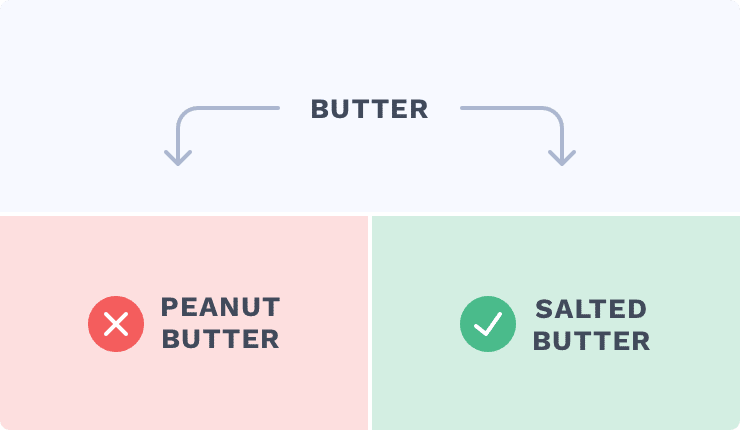 Constructor Search rises above the butter-peanut butter confusion. It uses a multitude of NLP approaches to transform a query from a string of characters into intent, and ultimately into prioritized search results. Resolving semantic intent isn’t a new problem in search, but it is a hard and frequent problem. Consider chips (potato chips vs. chocolate chips vs. memory chips) or water (bottled water vs. coconut water vs. tuna packed in water) and many others. With automated NLP processing, Constructor Search helps your customers succeed where ordinary search engines fall down. NLP in search isn’t a single technology, rather a set of interrelated computational approaches that work together to home in on user intent. Correcting phonetic, fat finger and spacing errors automatically. Identifies entities within a block of text and assesses their meaning and importance. Keeping users on task is an important job for a search engine. When users find what they’re looking for, they’re likelier to purchase. If they don’t find what their looking for from search, users don’t think they messed up—they think your site doesn’t have what they’re looking for. And they may leave, never to return again. We call this phenomenon “shadow churn.” It happens frequently, perhaps with 40%-65% of new visitors. Site exits can happen for many valid reasons. But they shouldn’t come from ineffective search results, especially when Constructor Search and NLP can correct so many of the common language processing errors. NLP works along with machine learning-enhanced reranking, collaborative personalization and merchant controls to provide an automated solution that improves conversions, revenue and customer loyalty.